Orange, orange everywhere, I hummed to myself. The color was a bit overwhelming, but also mesmerizing. I remember wishing I’d had an orange M&M to compare the color too. Or an orange crayon. It wasn’t neon orange. It wasn’t the color of the sun or a piece of fruit. It could sometimes look like fire. 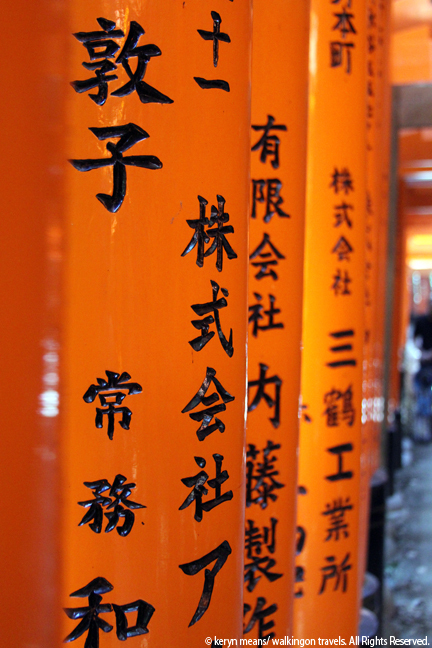 To us, it was simply the orange of many of the shrines we had seen in Kyoto so far. There was just a whole lot more of it. We had arrived at Fushimi-Inari Taisha. Color would follow us the rest of the day. 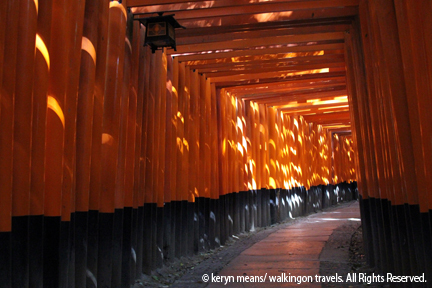 If you are a movie watcher, you might recognize the gates of Fushimi from one of the scenes in Memoirs of a Geisha. 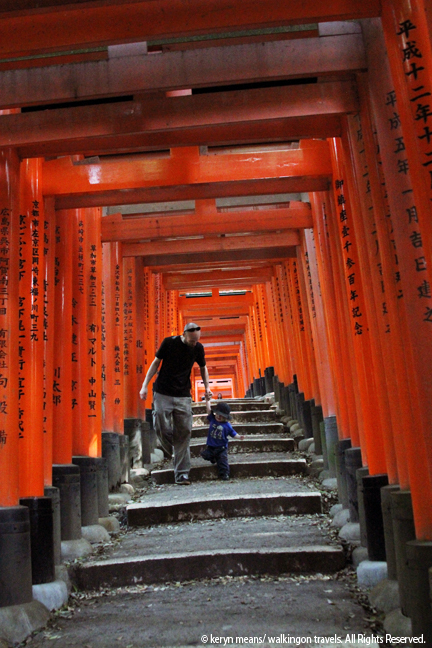 The young Sayuri runs through a path of orange pillars on her way to the school. I was enchanted as much as the next person by this scene of cinematic beauty. When I decided to do a stopover in Kyoto on our way home from China this past May, I just knew we had to see them. It wasn’t hard to find, but it also wasn’t in central Kyoto. It was much farther south. Fushimi was in southern Kyoto. The simplest way to get there was by train on the JR Nara line. You can easily take this train from Kyoto station. Two stops down is Inari Station. The ride takes 10 minutes at most. I was a little worried about finding our way after we got off the train, but there was never any need. 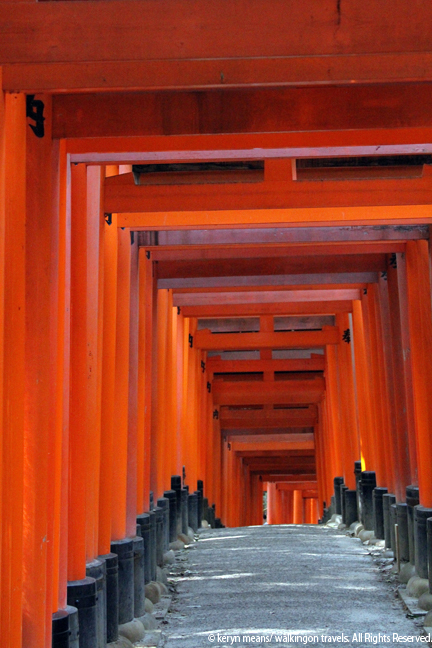 As soon as you arrive at the platform, you can already see the giant gate that welcomes you to the Fushimi shrine. And when I say giant, I mean at least 2, maybe 3, stories high. 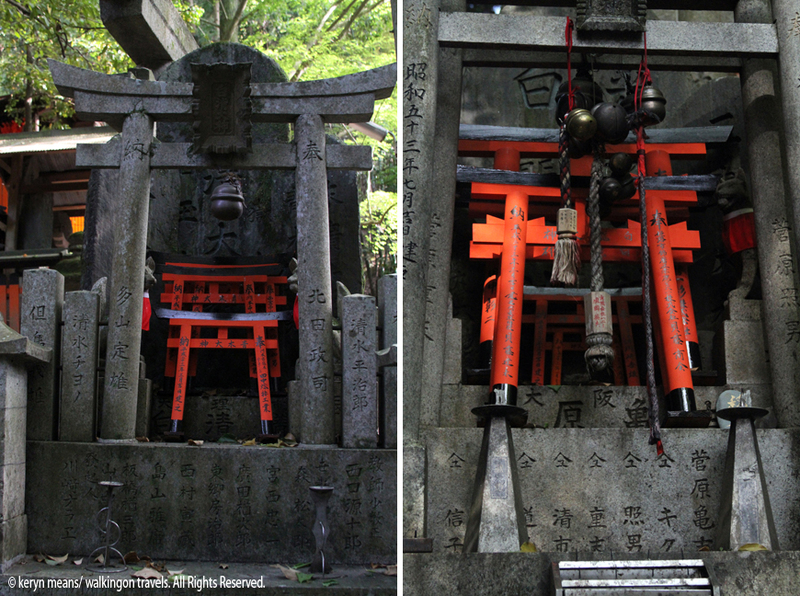 Fushimi, which is dedicated to the god of rice and sake, is the head shrine of the Inari cult. 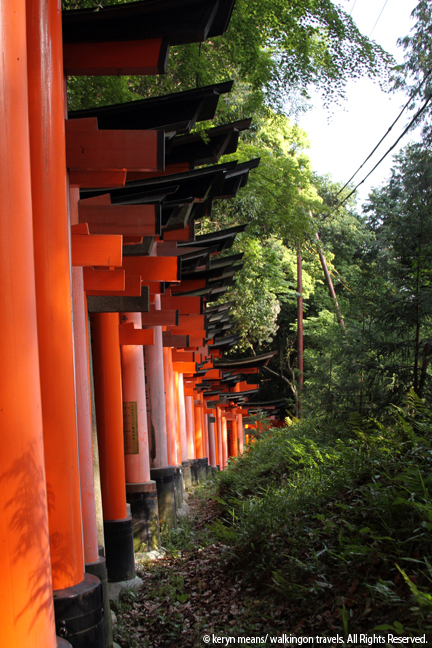 The highlight of this shrine is not the temple and many shops at the base, but the over ten thousand vermilion (guidebook’s description of the orange color, and I’d have to agree) gates that wind their way up the mountainside. This is what we had come for. We entered the first section with several people. Not only was the sight free to visit, but it was also a chance to get into nature and do a little hiking. One woman passed us on our way in. She looked like she was ready to make it to the top. We knew the maze of gates was about 4 km long. We had no aspirations of getting very far. We would let Dek lead the way and let us know when he’d had enough. The boy was a champion climber. And runner. After the first set of gates, we lost many of the tourists and went on with just a handful of people. Going at a toddler pace we were soon left alone in the wonderment of so many gates squished so close together. Dek was able to run and we didn’t have to worry. The gates fenced him in. Since there was a slight incline in places and even a few steps, he was slowed down often enough for us to keep him in our sights. It was a win, win situation for the whole family. After a section of gates, the path would open up to an area of shrines adorn with mini gates and statues of foxes, thought to be the messengers of the gods. Dek enjoyed peering at the animal statues and meowing at them (he meows at everything. We have a cat.). Prayer cards were left on some shrines. Candles and incense at others. Sunlight was able to filter through the trees and gates casting a brilliant glow on the orange gates. In other sections, the gates were so close together and the forest so dense that it was too dark to shoot a picture without a flash or tripod. As we walked along, I read more of our guidebook entry for Fushimi. Every ten years the gates were replaced. Businesses bought a gate hoping for financial prosperity. Their names were written in black on the gate they had purchased. All of this delightful information went over Dek’s head, but Mike and I had fun picking out the newer gates that had recently been replaced and the older gates that were probably up next. The color change from old to new pillars was dramatic. I always prefer older, worn woods, so of course the ones who would be replaced soon were my favorite. Some gates were missing completely. Either they had fallen down (doubtful) or they were taken out in preparation for the new gate going in. Just the base remained. After almost an hour of walking, our boy was spent. He had been a real trooper. The stroller, although we brought it with us yet again, was useless. Will we ever learn? I strapped Dek into our Ergo and we kept going. We came to a resting place with a small tea house about 20 minutes later. It was already closed as it was getting late in the day. We saw the same woman we had seen at the beginning making her way down. She look at us with amazement and said “It just keeps going!” We decided this might be the time to head back to our machiya. It would have been nice to get to the top. I read that the view of Kyoto was stunning. It just wasn’t in the cards for us that day. Or perhaps any day in our near future. I don’t need a reason to go back to Kyoto, it has already convinced me I need to go back. The brilliant orange of Fushimi, is just another excuse for a return visit. What’s for the kids? Endless paths to discover and lots of running space. Beautifully carved foxes and small shrines to (respectfully) explore. The path splits at certain points, so you can let your kids lead the way. What’s for Parents? Fresh air, easy hiking for everyone, educational opportunities to teach yourself and your children about a different culture and religion. There is also a tea shop part way up the mountain if you need some refreshment. The gates can corral toddlers for a bit so you don’t have to worry about them wandering off the path. I went there a couple of years ago. I loved Kyoto. These photos are bringing back some pleasant memories. Great blog! @theplaceswevebeen- I just swung by your blog. I have been dying to go to South Korea. My cousins, who were born there, just went back for the first time. Their pictures are incredible. I can’t wait to check it out for myself. Thanks for stopping by! I literally have hundreds from this afternoon trip. It was so hard to choose. I have a feeling I’ll be sneaking in a few more too. too bad it was already dark when i got there even if it was only 5:30Pm.I was scared to walk further.